Fertilizers add nutrients to the soil that a plant needs to grow. As plants grow, they deplete the nutrients in the soil. Grasses are hardy and will not die because of diminished nutrients, but a lawn in need of nutrients will look thin and unhealthy. 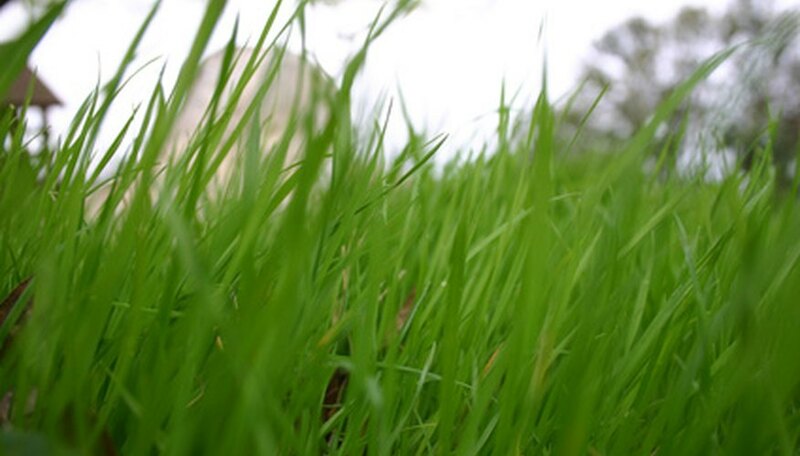 A lush, green lawn results from fertilization. Generally, you should fertilize your lawn at the time of year when the grass is most actively growing, in the spring and fall for cool season grasses and in the late spring for warm season grasses. Lawn fertilizers contain a blend of nitrogen, phosphorus and potassium, and the amount of each that you use will depend on the needs of your lawn. Scotts belongs to a family of plant-care products that also includes MiracleGro and Roundup and is the official lawn care company of Major League Baseball. Scotts offers lawn fertilizers for all seasons, including fertilizers appropriate for specific regions and fertilizers intended for growing new grass. Scotts also offers combination products that fertilize the lawn while also controlling weeds and bugs. Scotts' advertisements claim that its fertilizers do not use any fillers. Vigoro produces several lawn fertilizer products, including fertilizers intended for specific types of grass and specific purposes, such as starting new grass seed. Many Vigoro fertilizers are time-released, prolonging the effects of fertilizer applications over several weeks. Several fertilizers are intended especially for greening lawns and advertise that improvement can be seen in 72 hours. Ironite fertilizers are distinctive because they provide minerals aside from the major three nutrients, nitrogen, phosphorus and potassium. Ironite advertises that its fertilizers will not burn lawns, which can be a problem when treating lawns with fertilizers high in nitrogen. Ironite produces two major lawn fertilizers: a mineral supplement and a traditional fertilizer that also contains additional minerals and micronutrients. Milorganite is an organic nitrogen fertilizer, rated as "Exceptional Quality" by the U.S. Environmental Protection Agency. In addition to traditional fertilizer ingredients, Milorganite also adds iron and organic materials to the soil to promote greening and growth of the lawn. Milorganite contains non-leaching phosphorus, which is less likely to contaminate groundwater while remaining available for the lawn to use. Lesco is the leading U.S. producer of lawn care products, and 130,000 lawn care and golf course professionals use its products, according to the manufacturer. Lesco produces lawn fertilizers to meet a range of needs, including products that include micronutrients in addition to the traditional components.